Photo by Brandon Macz: WSDOT is holding a public meeting to discuss soil contamination on the Montlake Market property and building preservation options on Jan. 30. Following December soil testing that found petroleum-related contaminants on the Montlake Market property and in the groundwater, WSDOT is hosting an informational meeting about ongoing efforts to preserve the site on Jan. 30. The Montlake Market was removed and later added back into plans for a reconfiguration of Montlake Boulevard for the next phase of the SR 520 Bridge Replacement and HOV Program. Last session the Legislature added a proviso that directed WSDOT to spare the market from demolition if feasible. 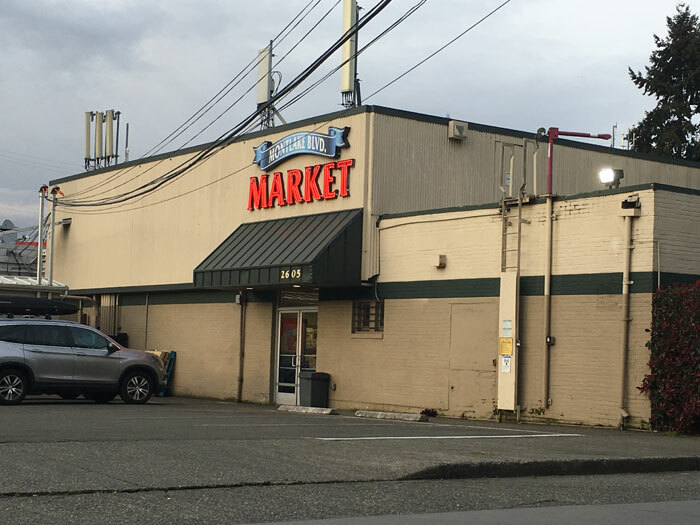 The transportation department found petroleum-related contaminants during soil testing in the public right-of-way near the Montlake Market and 76 gas station site in 2016 and 2018, according to WSDOT, and conducted testing on the market property last December. Innovex Environmental Management completed the Third Supplemental Phase II Environmental Site Assessment for WSDOT, which it provided to the transportation department on Jan. 16. WSDOT reports it is contacting elected officials, Montlake neighbors and other project stakeholders with the results, which will also be shared during a public meeting 5:30-7:30 p.m. Wednesday, Jan. 30, at St. Demetrios Greek Orthodox Church, 2100 Boyer Ave. E.
The Jan. 30 meeting will also address WSDOT’s evaluation of the Montlake Market property for preservation, potential scenarios for preserving the building and technical constraints and tradeoffs associated with doing that. People will also hear design-build contractor Graham Contracting’s construction proposal for the Montlake Phase of SR 520 Bridge Replacement, which includes a new West Approach Bridge South for eastbound traffic that will connect to the floating bridge over Lake Washington, a lid over 520 and a bicycle/pedestrian land bridge east of the lid that connects the Washington Park Arboretum and East Montlake Park.